When you’re the parent you sometimes get to the point of ultimatums at ten paces. The Muffet has declared that she would rather starve to death than apologise profusely for behaving like a toddler at dinner last night. I’m hoping that some Bulgarian Rock will change her mind. I’ve been meaning to make this ever since Darrell Lea went kaput. We traditionally buy it for my father-in-law at Christmas, so time has been running out for a practise run. I found a recipe at Food.com that had the basics, but was a little light on detail. I’ll try to fill you in. This one is time consuming, plan it for a day you’ve got some pottering about to do. Place in a large saucepan 450 grams of liquid glucose (you can get it at the supermarket where you get the vanilla essence and baking powder and so forth), three and a half cups of sugar and one and a quarter cups of water. Bring it to the boil while stirring with a wooden spoon to make sure everything dissolves properly. When it’s boiling, reduce the temperature a bit, you want it more than simmering, but less that boiling its head off. Now comes the bit that people seem to find challenging about confectionery making, boil it until it is at the hard crack stage. This will take AGES. For me, today, nearly two hours. It doesn’t need much attention until right at the end, just wander past every so often and give it a stir. When it’s starting to look a little thicker, start testing it. You drop some from your wooden spoon into a cup of water. It’s at the hard crack stage when it forms a crunchy ball in the water. Before that point, take a bowl and drop an egg white into it with half a teaspoon of vanilla essence and half a teaspoon of almond essence. Beat it with electric beaters until soft peaks form. Now go back to concentrating on your sugar. It will start to go yellow and quite thick. I usually panic and take it off too soon because I don’t want a pan of burnt sugar, and I think that’s what I’ve done this time. Anyway, take it off the heat before you burn it and start beating it with the electric beaters. It will start going white quite quickly as you incorporate air into it. Tip in the egg white mix and keep beating. The instructions on food.com say beat it until it is thick, but it’s pretty thick to start with. So I only beat it for a minute or two. 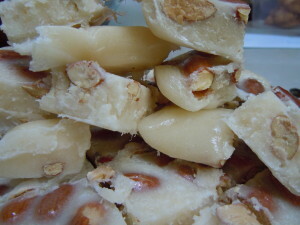 Fold in three quarters of a cup of UNsalted almonds and pour the lot into a roasting pan lined with baking paper. Before it is cool you can lift it out of the pan and start chopping it up with a large knife. Mine has cooled down now, and because I didn’t wait until the sugar was at the hard crack stage, merely at the really chewy stage, I appear to have made Bulgarian Fudge. However, it tastes right. I might try putting it in the fridge.